Outward Bound Eskdale is used almost exclusively for our work with apprentices, graduates and young people at the start of their careers. 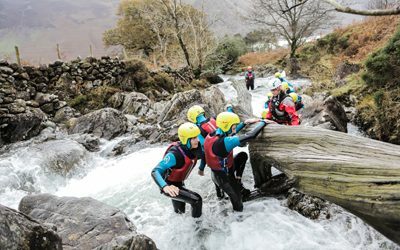 The centre opened in 1950 and being located on the western coast of the Lake District, it's the perfect wilderness location for our learning and development programmes. You’ll stay in a twin or triple room in one of our accommodation blocks. All of our bedrooms are ensuite and we provide bedding and towels. There’s plenty of space for your luggage and if you get wet on adventures (this is the Lake District after all) you can dry your kit in our drying rooms. You'll be able to make a brew in your room – but you won’t be able to access social or stream a film – wifi just doesn’t stretch that far. You might also like to know that all of the energy supplying our accommodation comes from renewable sources. Our bio mass and air source heat pumps mean even if you're last in the shower there will be plenty of hot water. The food at Eskdale is made fresh every day by our team of chefs. They use locally sourced ingredients and can cater for all dietary requirements – just let us know what these are before you arrive. With plenty of choice for breakfast, lunch, dinner and snacks, we can promise that you won’t go hungry at Eskdale. In April 2018 we retained our 5* food hygiene rating from the Food Standards Agency. 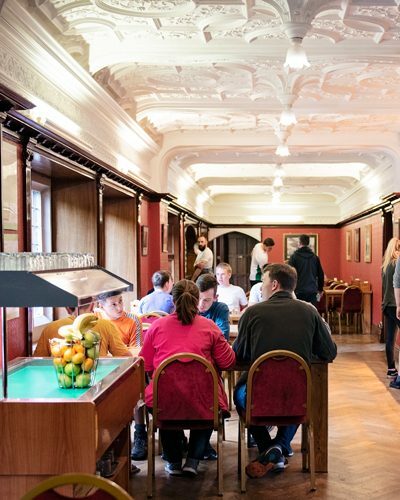 In the main house there’s a bar, a games room and plenty of space to chill out. We hope you’ll spend your down time talking to the people you're here with – but if this gets too much you can access wifi from the main house. Phone signal isn't always great, but there are plenty of landlines - just ask if you need to make a call. Eskdale Green is the nearest village, it's rural but has a small village store where you can get cash back if you need it. It’s a cliché – but you’ll get out of Outward Bound what you put in. During your programme you’ll work in a small group and will have an instructor with you all the way. There aren’t traditional classrooms at Outward Bound. No death by Powerpoint. You’ll be outside, maybe rafting on our tarn, walking up a mountain or canoeing down the river. And when you come back to centre, you'll have a dedicated review room where your group can talk about what you’ve learnt and how you can apply that back at work and college. You have nothing to lose. Grab this opportunity and by the end you might just realise that you’re capable of more than you ever thought possible! 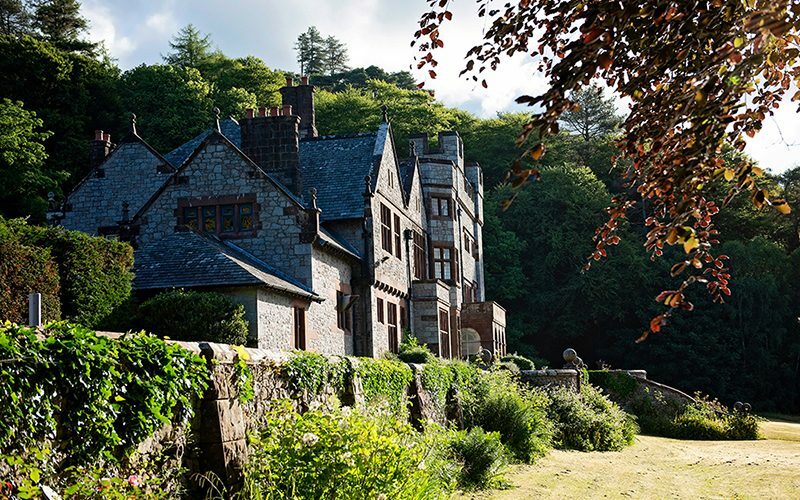 The Gatehouse at Eskdale was built in 1896 as a country retreat for Lord Rea, a Liverpool coal and shipping millionaire. The grounds were designed by the the famous landscape architect, Thomas Mawson of Windermere. Lord Rea was disappointed that the Gatehouse didn't have it's own tarn and so he built one! Outward Bound bought the house and opened Eskdale as our first Mountain School in 1950, joining the two Sea Schools we owned in Aberdovey, Wales and Moray, Scotland. Lord Rea acted as Chairman of the School in the early years and his local knowledge proved invaluable to Outward Bound gaining acceptance in the area. The house became a Grade II listed building in 1967 and there are still lots of original arts and crafts features to be seen, including the copper fireplaces, wood panelled billiard room and the stained glass window. Outward Bound's work at Eskdale was often pioneering. Until the 1950s Outward Bound courses had only been available to young men aged 14-19. Eskdale changed this, running occasional courses for girls and courses for 'seniors' (men aged 20-25). They also replaced the traditional track and field events used by the Sea Schools with a revolutionary alternative: 'circuit training'. Circuit exercises produced fitness and stamina much more aligned with adventure in the mountains, and circuit training became a well established part of the four-week courses. Are you one of the 1.2 million people who've been on an Outward Bound course in the UK since 1941? Was your course at Eskdale? We'd love to keep in touch!